Newsome Creek drains the north side of the Black Mountain / Mount Hilliam plateau. The watershed rises to an elevation of about 1500 metres, and it has a total catchment area of approximately 18 km2 . The watershed includes two primary sub-basins, drained by the east and west tributary creeks, and a minor tributary on the northwest side. The steep slopes below the edge of the plateau drain onto a gently sloping bench that extends about 5 km to Shuswap Lake. The upper part of the bench lies at approximate elevation 600 m. The east and west tributary creeks merge on the bench near elevation 470 m to form the main channel of Newsome Creek, and the minor tributary joins this main channel at elevation 450 m. Newsome Creek passes below Highway 1 on the lower part of the bench at elevation 395 m and it drains into Shuswap Lake at elevation 350 metres. In 2009 the Black Mountain plateau had a severe wildfire (Notch Hill Fire – K31483) that burned 2,857 hectares. In 2010 a small part of the burned area was logged. The total area salvage harvested was 105.2 hectares or 3.6% of the total wildfire area. All of the salvaged area was re-planted within two years according to Ministry of Forests, Lands, Natural Resource Operations and Rural Development. The steep slopes within the upper reaches of the tributary gullies were left unlogged. 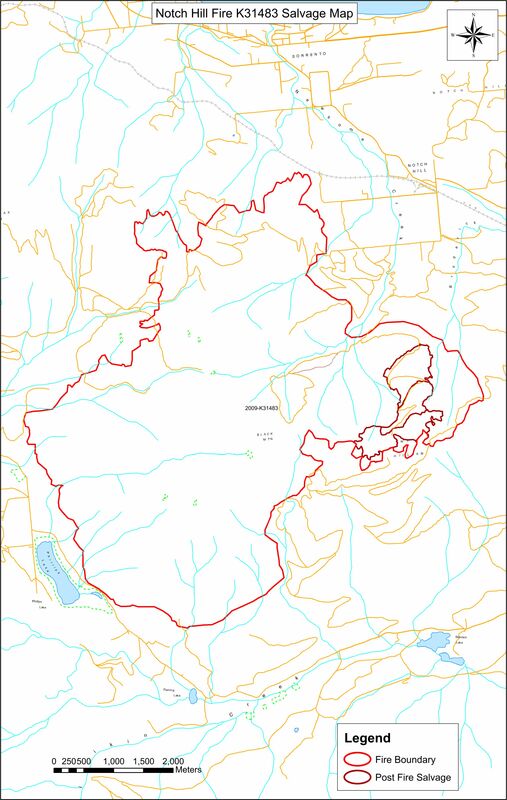 After the fire the Ministry of Forests and Range reported that the severity of the burn within the Newsome Creek watershed was “low to moderate, and in localized areas, was high… and the risk from flooding was low to very low in the two main tributaries.” On the map below the dark red-lined areas appear to be the “post fire salvage” that accounts for 3.6% of the total wildfire area. 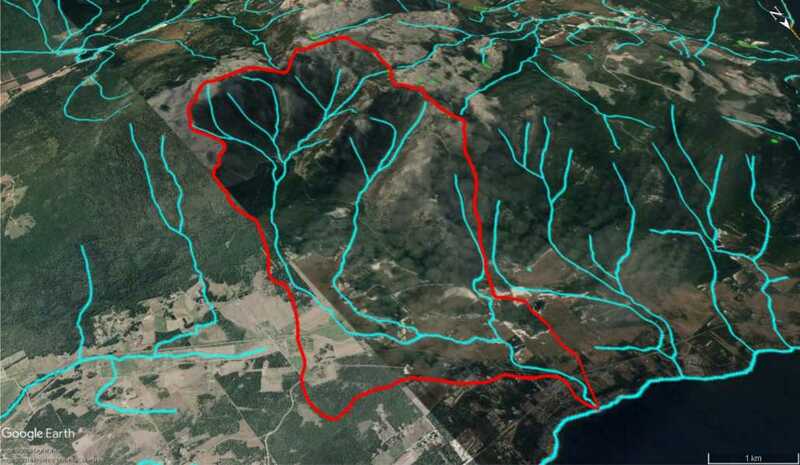 Newsome Creek and its tributaries flow out of the wildfire area, north (up the map) to Shuswap Lake. 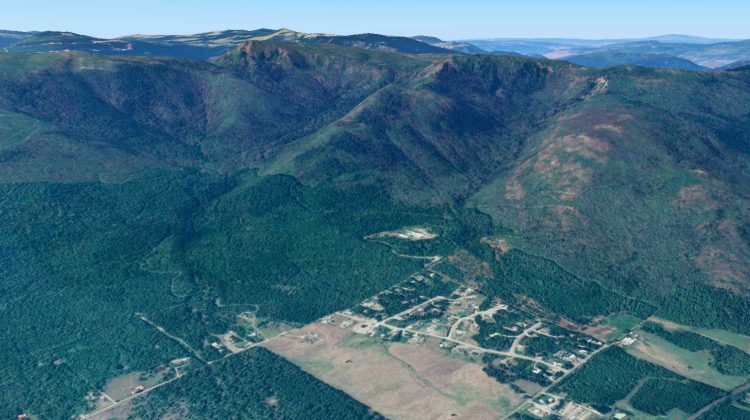 At the Community Stakeholders Information Meeting on Oct 18, 2018 concerns were raised about how the fire effected the way water runs off the mountain. An official from FLNRORD explained that when there is a loss of trees, water is not retained by the land as it was prior to a fire. A wax-like crust from the hot temperatures often forms on the surface and repels water. Logging and replanting can help open the ground for better water penetration, and new root systems can help take up the Spring melt. 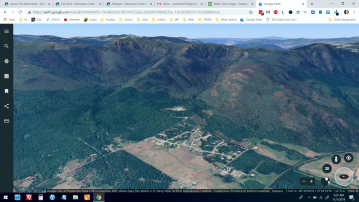 It appears in the Newsome Creek Watershed the beneficial effects of logging and replanting are minimal since only 3.6% of the burned area was logged and re-planted. For a full screen look at the watershed click here to go to Google Earth where you can interactively view the entire Sorrento area. Drag the image, use the magnifier, or double click the red and white arrow to navigate.